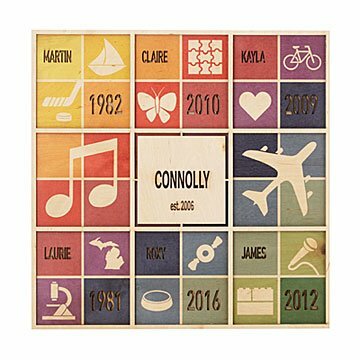 Customize the laser-cut squares with names, birth years, and icons representing hobbies or traits. For the family that's beyond proud of what they've built, this keepsake art celebrates every "building block" and what makes each member one-of-a-kind. Customize the laser-cut squares with names, birth years, and two icons that represent their hobbies or traits. Together with a center square that features the family name and "established" year, it creates a colorful, modern work of art that adds a cozy touch to your home decor. Hanger included. Made from birch plywood in Hillsboro, Oregon. See the complete customization instructions and list of available icons. Check out the Fabric of Our Family Blanket - Building Blocks here. We love this! It was for our anniversary, but our kids like it, too. A nice way to have a unique customized "portrait" of our family in our home. The 14" square is a bit small for the price. We gave this as an anniversary gift.